Monaco have suspended head coach Thierry Henry until a final decision is made on his future. The former Arsenal striker joined the club in October 2018 after the departure of his predecessor, Leonardo Jardim. But we understand Monaco are now in talks with Jardim to replace Henry in a shock comeback for the Portuguese boss. Henry has managed just five wins in all competitions in his three months in charge of the Ligue 1 team, who are in the relegation zone, two points from safety. Henry is yet to win a home league game, with their last match at the Stade Louis II ending in an embarrassing 3-1 French Cup defeat to Ligue 2 side Metz. Their previous game there resulted in a dreadful 5-1 league defeat to Strasbourg, meaning Monaco have not won at home since May last season. 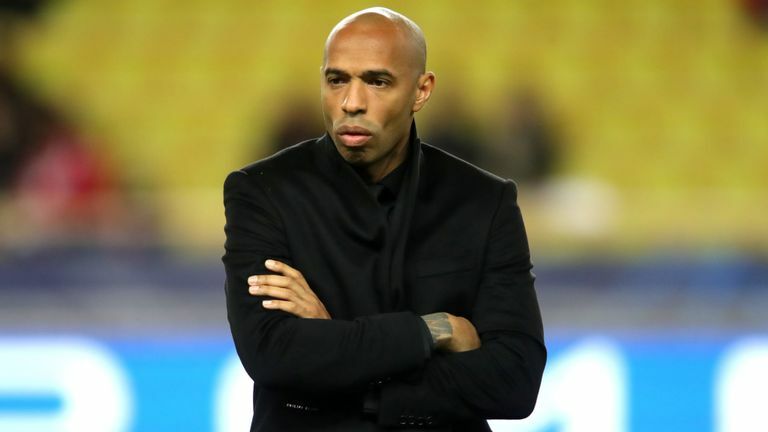 Henry – who has won just two of his 12 Ligue 1 matches – was forced to apologise for insulting Strasbourg defender Kenny Lala during their recent league defeat. Television cameras caught the Frenchman shouting abusive language at Lala as he delayed a throw-in with Strasbourg winning 2-1. Henry’s assistant Franck Passi – who had spells as caretaker boss of Marseille and Lille – will take training on Friday ahead of the home league match against Toulouse on Saturday February 2.